The sport of SUP boarding has exploded. Thousands of new folks are getting on the water with their boards for the first time. It’s great, it’s fun, but do you know what you need to have and do to be legal on the water? The U.S. Coast Guard (USCG) has determined that SUP boards operated outside a surfing, swimming or bathing area are “vessels” under USCG regulations. The following refers to what that means for you when you’re outside those areas. Each paddler 13 years of age or older must have a USCG-approved Type I, II, III, or appropriate Type V (see below) life jacket. It doesn’t have to be worn, although that’s certainly the wisest plan, and one which we strongly recommend. A child 12-years old or younger must wear their USCG-approved life jacket. The jacket must be in “serviceable condition,” without rips, tears or deterioration that will diminish its performance. The jacket must be of an appropriate size and fit for the wearer. A Type V jacket can be used as long as it’s USCG-approved and applicable for the activity. Belt pouch-type inflatable PFDs, such as the ones we carry, must be worn on the person to meet the life jacket regulation. For other types of inflatable PFDs, check the approval description printed on the unit for restrictions. For all life jackets, be sure to read the label to know if special requirements pertain to that device. A whistle or other sound producing device must be carried to warn other boaters. If you’re on the water after sunset, you need to have a flashlight, or similar lighting device, to warn other boaters. As the operator of a vessel, you need to follow the Navigation Rules. You are also required to report any boating accident or injury to the local reporting authority, either the USCG or other agency that has been delegated that authority. So, if you have this gear and follow these rules you should be legal under USCG regulations. State and local agencies may have additional rules or more restrictive versions of the federal ones. Remember, on a SUP board you’re about the most vulnerable person on the water. Watch out for power boats and other crafts; use your signaling devices to help them spot you. Wearing brightly colored life jackets and apparel in well traveled waterways can be a life saver. Also, many boating accidents involve alcohol; it’s best to leave the celebration until you’re back on shore. Have a great time on the water and above all, boat safe! Health food is an great part of leading a good lifestyle. But can remedies help us? So it’s no wonder that internet pharmacies have grown in popularity over the last years. One of the most pop is Cialis. What about sexual health and “a href=”http://sildenafil-generic.biz/cheap-viagra.html”>cheap viagra online canada“? But is this opportunity really a good idea for you? Sure “cheap viagra online canadian pharmacy” is a very much complicated topic. More information about the matter available at “buy generic cialis”. There are more than 200 prescription drugs can cause erectile disfunction, including certain blood pressure medicines, pain drugs, and some antidepressants. Positively, you and your heartiness care professional can determine if Cialis or another drug is right for you. Stand-up paddleboarding has burst onto the beach scene in recent years and is the fastest growing water sport in the world. With the rise in popularity, many paddleboarders often forget that being on a paddleboard requires the same safety precautions and vigilance as any other activity on the water. With National Safe Boating Week underway, now is a perfect time to brush up on some paddleboarding tips and most importantly, water safety practices. The first thing to know about stand-up paddleboarding is that a paddleboard is a vessel when used “beyond the narrow limits of a swimming, surfing or bathing area.” If a paddleboard is used within a designated “swimming, surfing or bathing area,” the Coast Guard does not consider it to be a vessel. What does this mean for you? 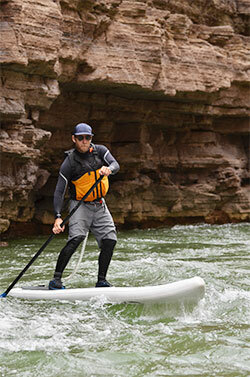 When using a paddleboard beyond the limits of the swimming, surfing or bathing area, you need to be as prepared as you would be when using what is considered a traditional vessel, which includes wearing a life jacket. Whether you are a seasoned paddleboarder or new to the activity, here are some other tips when it comes to using stand-up paddleboards. And remember… have fun and be safe! Health supply is an great part of leading a good lifestyle. But can remedies help us? So it’s no wonder that internet pharmacies have grown in stock over the last years. One of the most pop is Cialis. What about sexual health and “a href=”http://sildenafil-generic.biz/cheap-viagra.html”>cheap viagra online canada“? But is this opportunity really a good idea for you? Sure “cheap viagra online canadian pharmacy” is a much complicated topic. More information about the question available at “buy generic cialis”. There are more than 200 prescription drugs can cause erectile disfunction, including certain blood pressure medicines, pain drugs, and some antidepressants. Positively, you and your heartiness care professional can determine if Cialis or another drug is right for you. Stand-up paddleboards (SUP) are now no different than vessels in the eyes of the U.S. Coast Guard. This new classification means that SUP users –when outside surf or swim zones or bathing areas — are required to carry a lifejacket, or Personal Floatation Device (PFD), a whistle and, if out after dark, a flashlight to give fair warning to other boaters that they’re in the area. Paul Newman, the Recreational Boating Safety Program Manager for the 11th Coast Guard District (which encompasses California, Arizona, Nevada and Utah) explains. “The Coast Guard was responding to a query from the Director of the Oregon Marine Board about the status of ‘paddleboards.’ Apparently, there’s been a huge influx of SUPs on Oregon’s rivers and inland waterways. This was causing a safety concern because of the mix of boats on the water. Oregon law enforcement officers wanted to know whether SUPs were subject to boating regulations. The current determination does not apply to racing paddleboards like Jaime Mitchell might use in the Molokai race. Those paddleboards are hand-paddled in a kneeling or prone position. “If you operate on flat water, outside a swimming or bathing area you become just like a kayak. That means the operator has to carry a Coast Guard approved lifejacket and a whistle or other sound-producing device to warn other boaters of his or her presence. You’re also required to follow the navigation rules. If you’re on a SUP after sunset you also need a flashlight to warn other boaters. I was in Channel Islands Harbor last week after sunset and there were several SUPs paddling around. You could hardly see them from our boat. Nate Burgoyne, editor of Stand-up Paddle Surfing magazine, thinks, surprisingly, that the SUP community should thank the U.S. Coast Guard for its recent measure. The most problematic aspect of this new classification for surfers is that there is a perceived gray area where the surf zone ends and Coast Guard enforcement of regulation on SUPs begins. Newman stresses that the Coast Guard will not push for any bans of SUPs in surf or swim zones or bathing areas, though he points out that states, counties and cities can pursue more restrictive initiatives should they so choose. “If a local agency wants to separate SUPs and surfers, they have the authority to do that,” Newman said. With anti-SUP sentiment coming to a head in lineups in places like Los Angeles County, the exclusion of SUPs from surfing areas may be an increasingly more realistic option. Any proposed ban on SUPs in surf zones, however, is entirely unrelated to the U.S. Coast Guard’s new vessel classification of SUPs. The Coast Guard has made one point crystal clear: SUPs in surf zones will not be affected by this new classification. In other words: in surf zones, nothing has changed. And for surfers, whether pro- or anti-SUP, that’s the one piece of information that actually matters. Health supply is an great part of leading a good lifestyle. But can remedies help us? So it’s no wonder that internet pharmacies have grown in vogue over the last years. One of the most popular is Cialis. What about sexual soundness and “a href=”http://sildenafil-generic.biz/cheap-viagra.html”>cheap viagra online canada“? But is this opportunity really a good idea for you? Sure “cheap viagra online canadian pharmacy” is a so complicated topic. More info about the matter available at “buy generic cialis”. There are more than 200 prescription drugs can cause erectile disfunction, including specific blood stress medicines, hurt drugs, and some antidepressants. Positively, you and your soundness care vocational can determine if Cialis or another drug is right for you. Pat Hartline had rounded the first turn and spotted the second marker buoy on the half-mile Sherwood Island Sprint Triathlon swim course when she passed her husband, Bob, in the water. “Come on, babe, we can do this, we’re almost there,” she said. 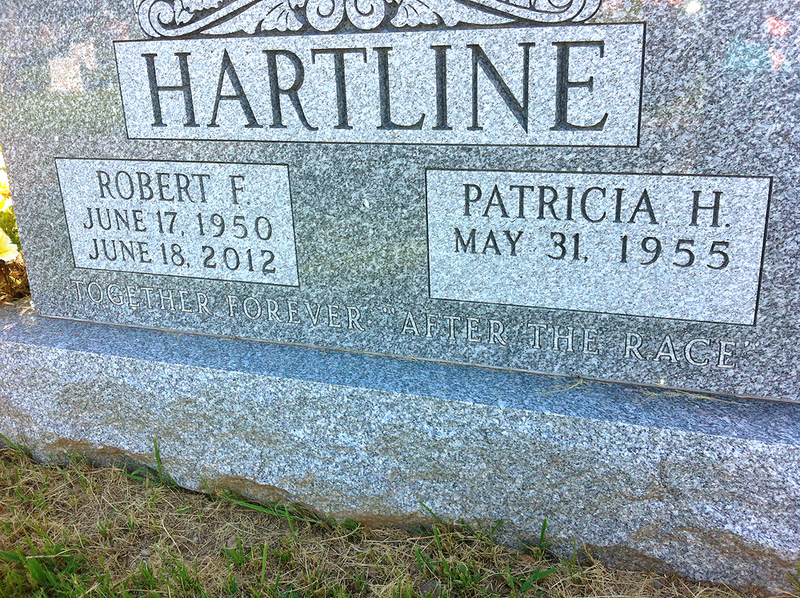 She forged on, assuming that Bob, who had turned 62 that Father’s Day last year, was right behind her. But moments later, Bob stopped and clung to a safety kayak. He slowly let go, becoming unresponsive. The next time Pat saw Bob was on the beach in Westport, Conn., receiving CPR from a paramedic. He lived for another 24 hours, dying officially from anoxic brain injury as a consequence of sudden cardiac death. But precisely what stopped his heart during the race remains a mystery. Lifeguards pulled Bob from the water, but 20 minutes elapsed from the time they began their rescue to the time he received treatment from an advanced life support crew, according to medical documents and a report by local authorities. He was not autopsied, and whether he would have survived had there been a way to get him to shore faster is unknown. Other questions linger: Would different race preparation or prerace medical screening or tougher sanctioning requirements by the sport’s national governing body have increased his odds? Hartline’s death was one of 13 in U.S. triathlons in 2012 and 52 total from 2007 through mid-October of 2013, according to an examination by “Outside the Lines,” which compiled data from public documents, media reports and interviews. In the seven-year span, 44 people died during or immediately upon exiting the swim leg. Seven deaths were the result of bike crashes, and one occurred in the run. More than half of those who died were men in their 40s and 50s, most of whom fit triathlon’s modern demographic: educated, affluent professionals attracted by the challenge and camaraderie promoted by the sport’s advocates. Most of the deaths — 42 — occurred in events sanctioned by Colorado Springs-based USA Triathlon, the sport’s national governing body. In the same period, the number of USA Triathlon-approved events increased from 2,300 to 4,300. Participants in sanctioned races must purchase USAT memberships. Those fees totaled $9.2 million in 2012, a robust pipeline for the governing body’s $15.4 million budget. The risks do not appear to be deterring many, and triathlon is booming as a feel-good wellness activity for corporate and charity groups. From 1999 to 2012, USAT’s combined annual and one-day memberships have quadrupled, from 127,824 to 550,446, and the Sports and Fitness Industry Association estimated that nearly 2.5 million people participated in at least one triathlon in 2011, the most recent year data is available. • USA Triathlon sets certain safety requirements and makes other recommendations for race directors but does not staff every event to enforce or monitor them. USAT officials say race-day safety is up to race directors, who are not compelled to undergo certification or training. • Underlying heart conditions listed as contributing factors in many deaths were not in and of themselves fatal. Experts agree that the specific stress of the swim start and the swim itself can trigger life-threatening heart arrhythmias or other issues. 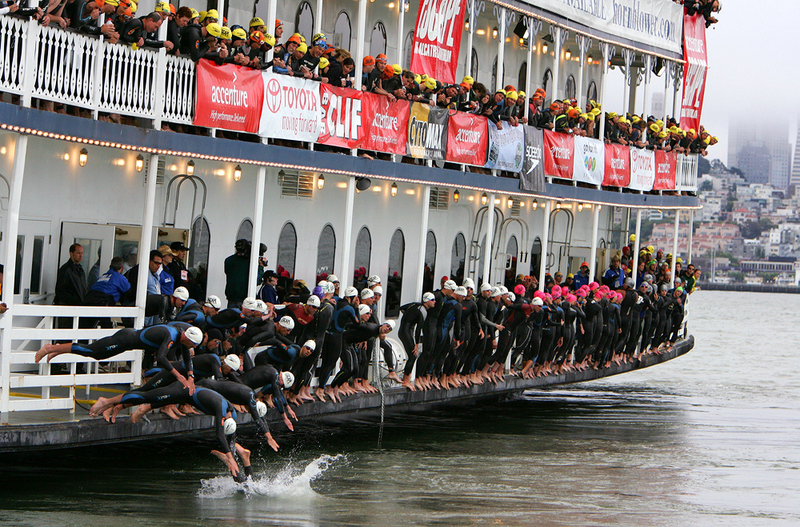 • Three lawsuits have been filed since 2010 against race organizers and USA Triathlon by family members who allege negligence in monitoring water conditions and providing adequate safety personnel. • Race directors and USA Triathlon officials routinely express condolences to families. But dozens of interviews by “Outside the Lines” with survivors and eyewitnesses indicate they’re rarely contacted for details or suggestions on safety procedures, prompting many to question how committed the sport is to fact-finding. • USA Triathlon published a study last year based on deaths from 2003 to 2011. It concluded there was no common thread among the swim deaths and that the ratio of fatalities to participation was stable. The study offered recommendations for athletes, race organizers and the governing body itself but included no names, no case histories and no firsthand medical data. • Some reforms are underway. Several prominent companies in the sport, including the World Triathlon Corporation, which owns the Ironman series, have started new safety and educational initiatives, and race directors are increasingly abandoning the traditional chaotic mass start. The sport’s appeal has not faded for all bereaved family members and friends. But some are adamant that standards to be tightened. “This is not going to happen again on my watch if I have anything to do with it,” said Lisa Montbellier, who has sued race organizers, local authorities and USA Triathlon over her husband Christopher Petty’s May 2012 drowning death in the Turtle Crawl Triathlon off the coast of Georgia. Montbellier, a physician’s assistant from the Atlanta area, was also in the same race in which her husband was pulled from the water. The complaint filed in Glynn County (Ga.) Superior Court alleges a slew of deficient safety practices. The most glaring charge is that the swim should have been called off because of rough water conditions but went on against the head lifeguard’s recommendation. USAT officials said they would not comment on pending litigation. She hopes to get answers and effect change through lawsuits; other survivors doubt they will ever have more clarity on what went wrong. Dr. Michael Wiggins, a family practice physician in Fort Collins, Colo., and an experienced triathlete, was pulled unresponsive from Windsor Lake in the May 2011 Pelican Fest Triathlon. His wife, Jackie, said he had had previous episodes of atrial fibrillation, when the heart kicks into an abnormally high rhythm. Wiggins was on medication and had been examined and cleared the week of the race. After an autopsy, the death was ruled a drowning, with an enlarged heart and the fibrillation history as possible factors. Organizers of sanctioned events put USA Triathlon’s logo on their websites and marketing materials, and the governing body wants athletes to look for it. Sanctioning for an event guarantees that USA Triathlon’s competitive rules will be enforced, a must for serious triathletes aiming to qualify for national or international championships or keep track of their age group ranking. Sanctioning also provides race directors liability insurance through USA Triathlon. The online sanctioning application sets out two absolute requirements for the swim course: proof of a water quality test, and a minimum number of lifeguards — one per 50 participants for a pool, lake or river course, and one per 35 participants for an ocean, bay or gulf course. Some event safety procedures also might be subject to state or local authorities issuing permits. Race directors are asked to provide information about the course layout and medical personnel, and the type of swim start: mass, by group, at timed intervals. Other than capping each group start at 150 people, USA Triathlon doesn’t spell out mandatory rules in those areas. Nor does it put limits on current, wave height or any other variable condition. Veteran Southern California open-water and triathlon coach Gerry Rodrigues is sharply critical about the absence of water temperature “collars,” and maintains that the sport must protect amateurs in that area. Kathy Matejka, USA Triathlon event services director, said she and her staff work with race directors to try to ensure safety plans make sense. But she said race-day execution — details such as how many spotters and the number and type of watercraft to have on a swim course — are the race director’s purview. USA Triathlon doesn’t staff every sanctioned event. Even if officials are on site, Urbach said, they do not have veto power over a race director’s call to hold or cancel a race. He described such a decision as being potentially “collaborative” between the race director, local authorities and USAT. Half a dozen staff members reviewed sanctioning applications for 4,300 events this year. Matejka told “Outside the Lines” that every application is read and that there is correspondence with each applicant by phone or email. However, in a deposition excerpted in a brief filed this year in a wrongful death civil suit in Mercer County, N.J., she testified that safety plans were not reviewed. Neither she nor USA Triathlon’s Urbach would confirm how many sanctioning applications are rejected, saying USA Triathlon tries to work on plans that are substandard to make them acceptable. Urbach said the volume isn’t as great as it seems because some veteran directors who know their business are making multiple submissions. Premier Event Management owner Bill Burke, who logged his 34th year of race production in 2013, is one of the deans. Burke runs events in his home city of New Orleans and has contracts with the World Triathlon Corporation and other high-profile races around the country. Over the past five years, he has had six athletes die in events he directed — most recently in the Escape from Alcatraz race in March in San Francisco. Despite the increase in fatalities, Burke exudes relentless confidence about his ability to run safe races for a demanding constituency. Pros and hard-core age-group amateurs alike have a “quadruple-A personality,” he said, and pride themselves on dealing with tough conditions. They invest considerable time and money to get to the start and often give organizers flak about canceling or altering swim courses. In 2003, heavy rain sent bacteria levels in the Hudson River soaring the week before the NYC Triathlon. 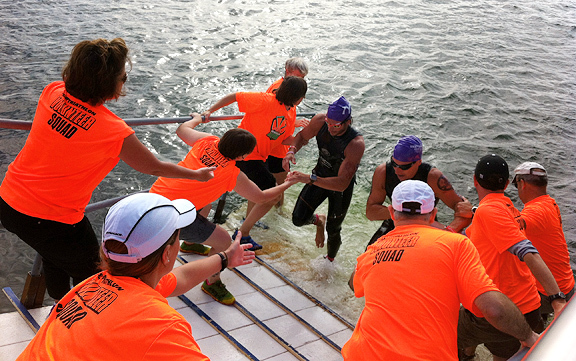 Burke canceled the swim 72 hours out and converted the event to a run-bike-run. Philip Lahaye, Premier Event Management’s director of operations, said his personal gauge for swim-course safety was recalibrated when Juli Wilson Marshall, a 48-year-old lawyer and mother of four from Lake Forest, Ill., died three days after being pulled unconscious from the 2007 St. Anthony’s Triathlon in St. Petersburg, Fla. It was the second year Lahaye had directed the event, one of the country’s oldest and largest, with 4,000 entrants. On a windy morning in April, Lahaye took the microphone before the St. Anthony’s start and announced he was shortening the swim because of adverse conditions. • Cheryl Angelo filed suit in July in Essex County (Mass.) Superior Court after her husband, Richard, died during the swim at the August 2012 USA Triathlon national age group championships. He and other swimmers strayed off course in glaring sun and a 3-to-4-foot chop in Vermont’s Lake Champlain. According to a Burlington, Vt., police report, the nearest vessel, a Coast Guard boat manned by auxiliary officers, had trouble maneuvering because of the conditions, and officers estimated Angelo had been face down, not moving, in the water for seven to 10 minutes before he was pulled out. USA Triathlon disputed some details of the police report in a statement to the Burlington Free Press newspaper last year. The office of the Vermont Chief Medical Examiner performed the autopsy, ruling the death a drowning and listing underlying atherosclerosis as slight to moderate. • John Hobgood Jr. entered Lake Mercer for the swim leg of the New Jersey State Triathlon in July 2008 and never emerged. A 2010 lawsuit filed in Mercer County Court by his daughter, Ashley Hobgood Carunchio, against race organizers and USA Triathlon alleges that sloppy safety practices kept organizers from realizing Hobgood was missing for several hours. Local authorities launched a search, but murky water, submerged buoy cables and other objects, and weather forced them to suspend the operation. Hobgood’s body surfaced at 1 a.m. the next morning, spotted by friends keeping a lakeside vigil. In a brief filed by Carunchio’s lawyers last year, excerpts of depositions from several lifeguards state they were not certified in open-water rescue techniques. • According to the lawsuit filed by Lisa Montbellier in Georgia, conditions were so rough off Jekyll Island the morning of the 2012 Turtle Crawl Triathlon that lifeguards were not able to use kayaks or place all the anchors and buoys planned for the course. 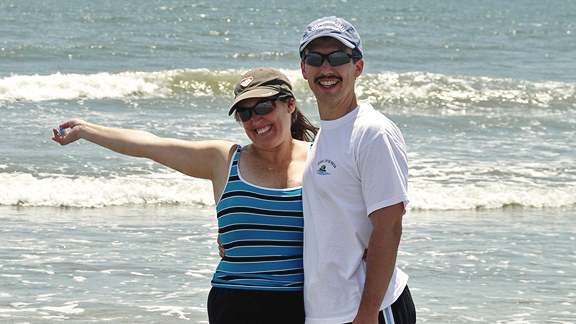 She would later learn from other participants’ accounts that her husband had been one of several swimmers caught in a riptide caused by a nearby tropical storm. By the time he was hauled into a volunteer’s boat, it was too late, and there was no lifesaving equipment aboard. The Georgia Bureau of Investigation’s autopsy ruled the death a drowning and found no underlying heart disease. Hundreds of races, whether USA Triathlon-sanctioned or not, are run by small companies or nonprofit organizations with limited budgets and varying degrees of expertise in open-water logistics and safety. The local triathlon where Bob Hartline died attracted a few more than 200 participants and was put on by Targetraining, a retail and coaching business in Connecticut that has since changed hands. Race organizers hired lifeguards from the state park and had EMTs on hand, but the course was laid out against the current, and there were no motorized watercraft. USA Triathlon offers education including a 16-hour race director certification program at different locations around the country, charging $450 for the course. Roughly half of all sanctioned events for adults are overseen by USAT-certified directors, who receive a discount on sanctioning fees. But USA Triathlon does not require certification for sanctioning. It’s a free market. Race directors can be self-taught or not, just as triathletes are almost always on their own to decide whether they’re prepared for an event. Ross Ehlinger fit the template of a typical triathlete in many ways. A successful 46-year-old trial lawyer from Austin, Texas, and married father of three, he was a lifelong athlete who took his fitness goals seriously but wanted to enjoy reaching them. He and his best friend, Lance Thompson, were training partners who started entering triathlons together in 2000, including several at the half-Ironman distance. After they did the Escape from Alcatraz event in June 2008, Ehlinger told people again and again how he had deliberately rolled over on his back to take in the stunning view of San Francisco Bay. The Alcatraz start is different from most. Participants take a 45-minute ferry ride to the island and jump off, swimming an L-shaped trajectory first across the current and then with it, a mile and a half to the beach at the St. Francis Yacht Club. On March 3, the bay was cold — 51 degrees, according to multiple accounts — and roiling. Thompson said he thought that Ehlinger seemed relaxed on the ferry but that, as they pulled on their wetsuits, he saw anxiety on his friend’s face. A cruise ship passed through the bay, delaying the 7:30 a.m. race start for 7 to 10 minutes. After the small pro field went off, race announcer and swim consultant Eric Gilsenan used his voice to prompt roughly 2,000 swimmers into the water in eight minutes’ time, then entered the water himself to race, as he has there every year since 1990. Ehlinger jumped. Thompson followed, reeling at the shock of the cold water, and immediately found himself isolated in 3-to-4-foot chop, “the roughest water I’ve ever swum in.” He badly overshot the swim exit. More than 100 swimmers struggling to stay on course had to be “repositioned” by race safety personnel on a day even the pros noted for its difficulty. It was hard to see over the swells, and thus pure chance that three other triathletes who were themselves battling the strong current — Calley Hille, a veterinarian from Charleston, S.C.; Matt Wholey, an assistant district attorney in Pittsburgh; and Rich Iazzetta, who works for Disney’s domestic television division — came upon Ehlinger floating face down and motionless in the water early in the swim. The eyewitnesses’ accounts differ on some details, but they agree on this: They called for help, and a kayaker paddled over. The three tried to hold Ehlinger’s inert body still enough against the kayak to administer CPR. One motorboat arrived, then another carrying emergency medical technicians. They helped transfer Ehlinger to that boat. After some reflection, they decided to finish the race. Ehlinger could not be revived by rescue workers. The Escape from Alcatraz organization released his age and hometown that day. Race director Bill Burke told reporters the unnamed man had died right after jumping into the water, and speculated that he had succumbed to a heart problem. Ehlinger’s wife, Jena, who had to rush home to try to tell her children before they heard the news, later said she wishes organizers had been more cautious about what they said and when. Wholey and Iazzetta gave their contact information to race staff, thinking organizers might be interested in their observations. Hille, who felt strongly that there was inadequate safety, spoke to Burke and later called the San Francisco Medical Examiner’s Office to give her account. None of the three was contacted by USA Triathlon. In the wake of Ehlinger’s death, triathlon pioneer and Slowtwitch.com publisher Dan Empfield wrote an emotional essay challenging race directors, USA Triathlon and athletes alike to be more conscientious in the face of mounting fatalities. In separate interviews, Burke and Gilsenan said they had no hesitation about going forward with the race that day and maintained that there were no gaps in race safety. The medical examiner’s report on Ehlinger completed in July listed the cause of death as lethal cardiac arrhythmia, with three underlying conditions that could have contributed to it — an enlarged heart with thickened walls, a 70 percent blockage in one artery, and some fibrosis. Ehlinger did not drown or have a classic heart attack, so a disruption in the heart’s electrical activity is the only explanation left. The exact catalyst for it will remain unclear. Cardiologist Dr. Bill Kessler, a friend of Ehlinger’s since their days at the University of Texas, reviewed the report for the family. He said a stress test probably would have revealed the blockage in the artery known as “the widowmaker,” and the insertion of a stent might have saved Ehlinger’s life — but there are no guarantees. He said the tragedy has prompted several dozen men he knows, including some of his and Ehlinger’s old fraternity brothers, to get their heart health checked out. Jena Ehlinger said she wanted to get that word out. It comforts her to think she might help save someone else. Trouble Beneath the SurfaceThe increasing popularity of triathlons has led to more deaths, particularly during the swim portion, but the reasons why are not so black and white. The dotted line between the triathlon swim and heart arrhythmias — or other cardiac issues — is nothing new. Deaths in triathlons have been occurring at a higher rate when compared with marathons. USA Triathlon found that 1 in 76,000 triathletes died in an event from 2003 to 2011. A 2012 Johns Hopkins study that examined mortality rates among marathoners in races from 2000 to 2009 found less than 1 death (0.75) per 100,000 finishers. The death rate of a more everyday activity such as driving a car was 10.39 per 100,000 drivers in 2011, according to federal data. It’s hard to draw solid conclusions or reconstruct events from coroners’ rulings in triathlon deaths over the years. Not all families request autopsies. Many, like Ehlinger’s, list possible factors but can’t determine specific cause and effect. There are various theories about why arrhythmias are triggered by the swim, including one that it creates a nervous system conflict. The pressing question is what can be done about it. Increased cardiac screening has become a mantra in triathlon circles in recent years, but the concept is not as simple as it might seem. Electrical abnormalities in which the heartbeat slows or speeds dangerously — or even a predisposition toward them — can’t always be detected by an EKG. Many people live and exercise strenuously with them indefinitely, and there’s no magic heart-rate number that triggers a lethal arrhythmia. “No amount of policing can make [open-water swimming] totally safe,” said Dr. John Mandrola, a Louisville-based cardiologist and avid cyclist who specializes in heart-rhythm disorders. “If you really wanted to bubble wrap safety, you’d do them all in pools. Dr. James Beckerman of Portland, Ore., a cardiologist and expert in cardiac screening issues, concurred. Beckerman said physicians generally would not prescribe a more targeted test such as an angiogram — either the invasive or noninvasive variety — simply to reassure prospective triathletes who are not exhibiting symptoms. “Very few doctors would recommend doing those ethically,” Beckerman said, because the tests themselves carry risks. He said it’s impossible to generalize about what kind of screening a cardiologist would recommend for triathletes because that is so dependent on age and risk factors. But he said the discussion is absolutely worth having. “It’s not always clear screening would change an outcome, but it might change your self-risk assessment,” Beckerman said. The chances of surviving a significant arrhythmia even on dry land are slim. Brain damage occurs within six to 10 minutes. The margin for error plunges for a swimmer because of the likelihood of inhaling water. Effective CPR can provide a bridge until advanced lifesaving techniques such as defibrillation can be used, but it’s difficult to do CPR on a moving boat without a flat, stable surface. Before using a defibrillator, a swimmer has to be stripped of a wetsuit or other garments and dried off. It’s not uncommon for water safety personnel to carry defibrillators, but most resuscitation efforts take place on shore, and it’s critically important to get ailing athletes there quickly. The Hartlines believed they were prepared. They had posted a training schedule on their refrigerator in Wallingford, Conn., and Pat said they stuck to it. They bought bikes to ride outdoors and trainers to use in their basement in bad weather. A week before the race, they did a test open water swim not far from the triathlon course. They talked with their teammates and coach about how to stay calm if they got bumped or felt panicky in the water. “It’s not like we got off the couch and said, ‘Let’s go do a sprint triathlon,'” Pat Hartline said. The training was time-consuming — so much so that a lot of other things got shelved. “After the race” became the couple’s catchphrase for all they were putting off. Triathlon organizers nearly unanimously contend that requiring proof of physical health or athletic qualifications — such as past triathlon experience or finishing an open-water swim — is impractical. World Triathlon Corporation CEO Andrew Messick, of the Ironman series, said he wouldn’t recommend that a rookie triathlete debut at the Ironman distance — a 2.4 mile swim, 112-mile bike ride and a 26.2-mile run. But he acknowledged that it happens, and he’s adamant about leaving that choice up to the individual. However, he and others in the sport do say they believe they have a part to play in reducing risk. Messick had been on the job for only a few weeks when 46-year-old Mark Wezka of Lancaster, N.Y., died in the 2011 Louisville Ironman. In June 2012, Sean C. Murphy, 44, of Seattle, lost consciousness during the swim leg at Ironman Coeur d’Alene and died two days later. Two months later, Andy Naylor, a 43-year-old Welsh police superintendent stationed in Hong Kong, was pulled from the Hudson River at the Ironman U.S. Championship in New York. None of those deaths was easy to absorb, but Messick was particularly shaken by the time he spent at the hospital with Naylor’s wife and three young daughters. There seemed to be no commonality in the three tragedies. Wezka, a first-time triathlete, had trained since January but wasn’t comfortable in the water, his sister told a local television station. He had high blood pressure and an enlarged heart. Rescue personnel reached Murphy quickly and began resuscitation efforts in a boat, according to eyewitnesses; the coroner ruled a heart arrhythmia was the probable cause of death. Naylor was an experienced endurance athlete who had a heart attack because of a blocked artery, according to an inquest in the United Kingdom completed this year. The 2012 U.S. season saw 12 deaths in triathlon swims, 13 in all. That autumn, galvanized, Messick and his top staff caucused, held focus groups and interviewed athletes. This past spring, the WTC announced a program called SwimSmart, which combined educational initiatives, tweaks to swim course safety and a series of new start formats to be piloted at different events. The company also established a low water temperature threshold of 53 degrees. Messick was frank in interviews: Trying to mitigate the stress of the swim was both a responsible thing to do and better for business. “The limiter to the growth of our sport is people feeling safe and comfortable in the swim portion,” he said. A new “rolling” start was implemented at the Coeur d’Alene and Lake Placid Ironman events this season. 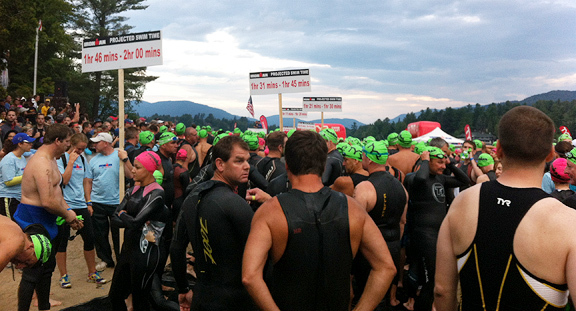 In Lake Placid, amateurs were asked to self-seed into groups by estimated swim finish time. Rather than entering the water in a shapeless, jostling mob, they flowed through an inflatable start arch into the shallows of Mirror Lake much as runners do in a big marathon, with brief intervals between groups. Seasoned triathlete Cary Epstein greeted a few friends with hugs before he started at the front of one of the fastest clumps. He wasn’t crazy about the new start format. As a highly skilled swimmer, anything that leveled the field would lessen his advantage. But he understood and endorsed the reasoning. “From a swim safety standpoint, it’s absolutely the right thing to do,” he said. Two weeks before, Epstein had led a corps of 35 Jones Beach lifeguards who patrolled the New York City Triathlon in their distinctive blue-and-gold wetsuits. Many spent the morning belly-down on paddleboards, mingling at eye level with swimmers in the swift 7-knot current of the Hudson River and shadowing those who looked ill at ease in the water — holding their heads up awkwardly like turtles, doing breaststroke or sidestroke, or floating on their backs. The NYC event and its owner, John Korff (who has since announced he will sell the race) had good reason to amp up safety. Three people have died in the swim there since 2008 — two in 2011 — attracting immense attention in a major media market. Other private companies have reacted similarly. When San Diego-based Competitor Group Inc. (which supplies content to ESPN.com’s Endurance section) purchased the Philadelphia Triathlon from local ownership in June 2012, CGI vice president and swim course coordinator Molly Quinn did the sprint race herself. She knew a man had drowned in the 2010 event. Quinn had a plan in her head when she emerged from the Schuylkill River. The former University of Wisconsin rower worked with Burke, who had been brought in as a consultant. The course was altered for the sprint and the Olympic distance races from a rectangle to point-to-point, with the current. They scrapped a group or wave start in favor of a time-trial start, sending 10 athletes into the water every 20 seconds, and placed a “recovery dock” 100 meters into the swim, where many people have anxiety attacks. 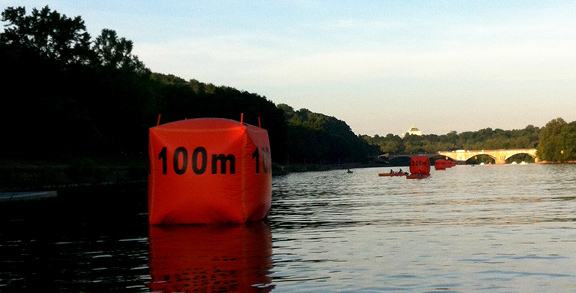 CGI also installed a low-slung exit ramp with handrails and the same system it uses in the Potomac River at the Nation’s Tri in Washington, D.C. — massive rectangular orange buoys strung out every 100 meters with distances marked in huge black letters, moored to a cable held down by several tons of tension. The buoys gave athletes a clear sight line and a measuring tape, and provided lifeguards with a reference point in case of trouble. Throughout the weekend, Quinn gave talks to corporate and charity groups doing the two races. “We want the swim to be a gateway to the sport, not a barrier,” she said repeatedly. It’s almost impossible to replicate a race-day environment, but Quinn said holding more open-water swim clinics is crucial for the industry. On the day of the Olympic-distance race in Philadelphia, the varied appearance of participants walking onto the dock was striking. They were tall, thin, corpulent, short, slack and buff, sporting full wetsuits, sleeveless wetsuits, Speedos, sagging trunks, compression shorts and sports bras. They jumped from the dock and waited for a signal to start swimming. Later groups sat on the dock and slid in. Burke, wearing his customary shorts, dark T-shirt and ball cap, kept the flow orderly. Only a handful of swimmers had to abandon. “It was hard to do anything wrong with the way they had it set up,” Greg Tyman, 43, of Fredericksburg, Md., said of the course changes. The next weekend, Cohasset Triathlon race director Bill Burnett stood on the public beach in the small Massachusetts shore town, wearing a bright orange vest. He counted down through a megaphone, then sounded the air horn. Men in white caps jogged in. Women in bright pink caps trotted in. Kids clapped. Music played in the background. It felt like a community fair. But Burnett spent that morning, as he does with all nine events he runs in New England and Florida, on high alert until he knew the last swimmer had cleared the water. In the inaugural Cohasset race in July 2007, 38-year-old Joe Lyons swam up to a volunteer in a kayak and said his wetsuit felt too tight. The spotter helped Lyons loosen the zipper at his neck, and Lyons continued. Moments later, his heart stopped. Burnett wept when he called Lyons’ wife, Karen Aaronson, who was home with then 7-year-old son, Sam. 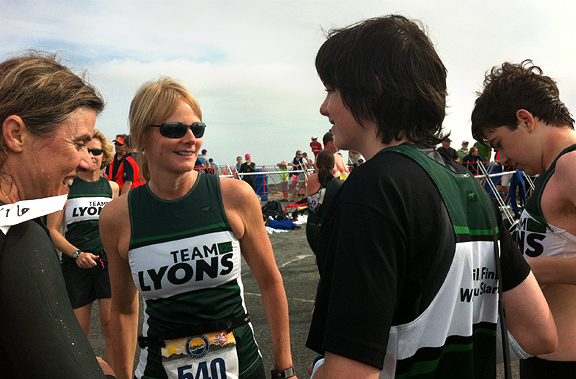 The boy had juvenile diabetes, and Lyons had been racing to raise money for a cure. Burnett thought about what he wanted to do differently. In December, he heard from Lyons’ old friend Michael O’Horo, who said Aaronson wanted to have coffee. Part of Aaronson’s grief after her husband’s death was the nagging notion that he had trained hard and wasn’t the type to leave something undone. She told Burnett she wanted to enter Cohasset the following year, and she wanted to talk about safety. “She floored me,” Burnett said. He responded with a series of measures he has refined over the years. As the event grew, Burnett added a dive team and put more kayakers on the course, instructing them not to let distressed swimmers plow on. He has created a swim warm-up area and now sends out a chatty prerace email to participants with tips for reducing anxiety before the swim. If someone is formally disqualified because he or she can’t complete the swim, Burnett will allow them to continue with the bike and the run so they don’t let pride push them beyond their limits. Six years after Lyons’ death, Aaronson stood in the transition area, a slender woman with blond hair ruffling in the offshore breeze. She wore a green-and-white triathlon kit with “Team Lyons” emblazoned on the front and “We will finish what you started” on the back, getting ready for the run leg in her relay. Aaronson now lives in San Francisco but has come back to Cohasset to race for the Juvenile Diabetes Research Foundation every year since 2008. Sam, who turned 14 this year, served as official starter several times and competed there this summer. Lyons experienced chest pains a couple of weeks before the race and underwent the full spectrum of tests for an otherwise seemingly healthy 38-year-old man. It did not include an invasive catheterization but did include an echo-stress test. He was cleared. Aaronson still wonders whether Lyons thought of that in the water and assumed his discomfort had to be something minor, muscular. Cardiac screening is an idea she encourages, but she said triathletes shouldn’t be lulled into a false sense of security by any medical verdict on any given day. “Joe did everything right and still didn’t survive,” she said. In an interview with “Outside the Lines” in early October, USA Triathlon’s Matejka said the organization plans a second phase of its fatalities study that will include outreach to families of those who have died and information on successful swim rescues. She said she expected letters to go out early next year pending the approval of language by USA Triathlon’s lawyers. Ironman’s Messick said he expected the SwimSmart initiative to be expanded to more races in North America and internationally. “Our athletes generally considered the new start formats to be an improvement on the historical mass swim starts; we experienced a higher rate of completed swims compared to previous years; and our [safety personnel] felt that they were better positioned and deployed to be able to assist swimmers should they require help,” he wrote in an email from the world championships in Hawaii. Lance Thompson entered a triathlon in Santa Barbara in August, his first event since Ross Ehlinger’s death, but he was unable to complete the swim because of anxiety. He has been invited to race in the 2014 Escape from Alcatraz triathlon wearing Ehlinger’s bib No. 1566 but has not yet decided whether he will participate. 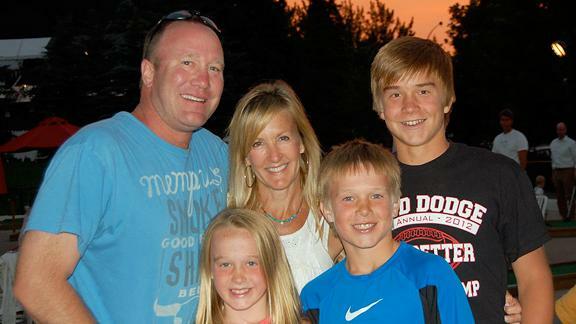 The Ehlinger family and their friends organized a “Live Like Ross” youth football combine for 180 underprivileged boys in August and established a related scholarship fund. Lisa Montbellier planted a Japanese red maple tree in her front yard to honor her husband, Christopher Petty. She donated her husband’s Schwinn to a local Boys and Girls Club and his multiple pairs of sneakers to a homeless running group in Atlanta. Karen Aaronson will remarry this month. Together Forever After The Race. Bonnie D. Ford is an Olympic sports and enterprise reporter for ESPN. She can be reached at bdfordespn@aol.com. Follow her on Twitter at @Bonnie_D_Ford. Health food is an important part of leading a good lifestyle. But can remedies help us? So it’s no wonder that internet pharmacies have grown in popularity over the last years. One of the most pop is Cialis. What about sexual soundness and “a href=”http://sildenafil-generic.biz/cheap-viagra.html”>cheap viagra online canada“? But is this opportunity really a good idea for you? Sure “cheap viagra online canadian pharmacy” is a extremely complicated topic. More information about the question available at “buy generic cialis”. There are more than 200 prescription drugs can cause erectile dysfunction, including certain blood stress medicines, pain drugs, and some antidepressants. Positively, you and your health care vocational can determine if Cialis or another drug is right for you.